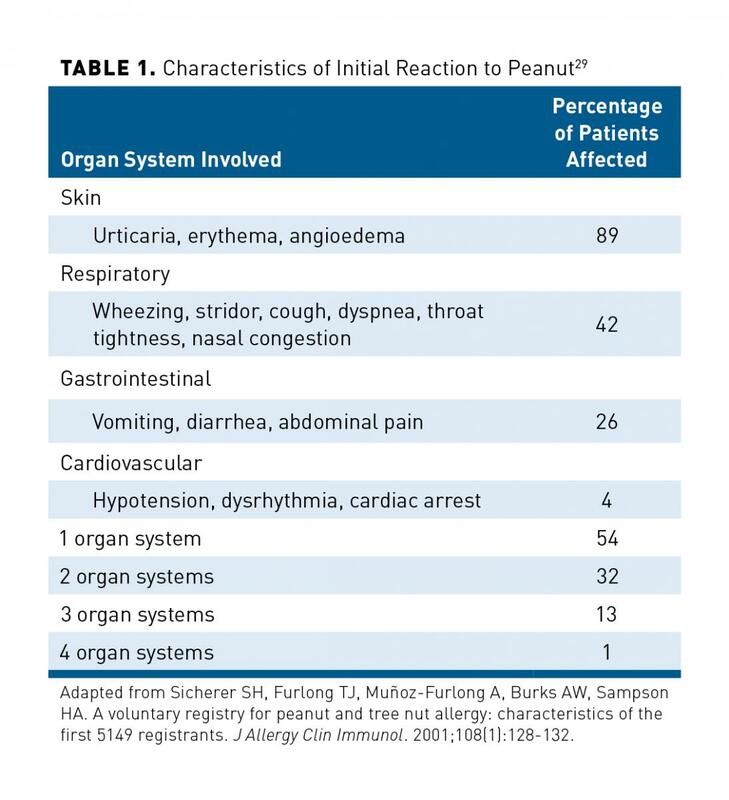 Symptoms of peanut allergy may develop very quickly, within seconds, or up to 2 hours after ingestion of even trace amounts of peanut protein in a sensitized person (1 peanut contains approximately 300 mg of peanut protein).28 The symptoms of peanut allergy may involve several organ systems, most commonly the skin, gastrointestinal (GI) tract, respiratory system, and cardiovascular (CV) system. Skin symptoms include acute urticaria, angioedema, or a pruritic erythematous skin rash. GI symptoms may include vomiting, abdominal pain, and diarrhea. The new 2017 NIAID guidelines represent a paradigm shift in current thinking on the prevention of food allergies. 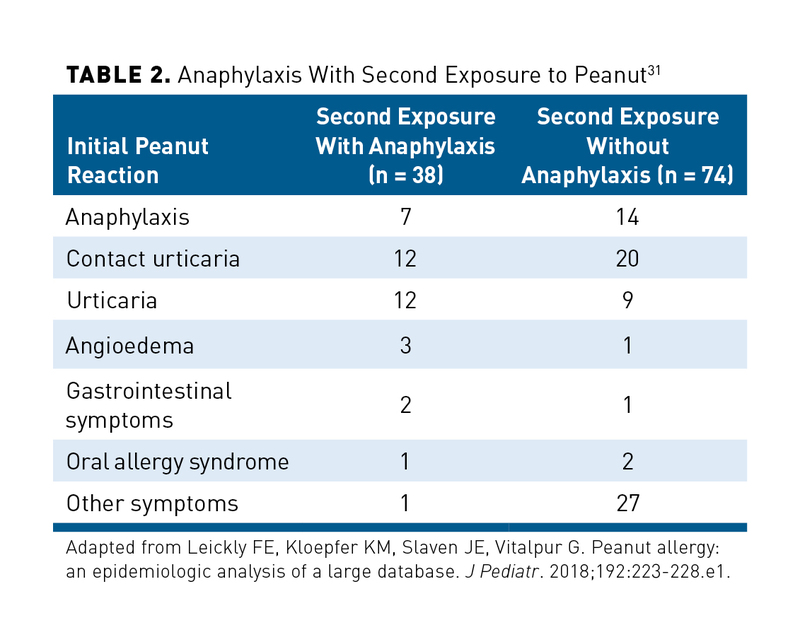 This has led to an educational gap for providers, as well as parents and caregivers, because many parents are understandably hesitant to introduce peanuts early to infants, especially those considered high-risk. A recent survey study conducted by Greenhawt and colleagues found that just 31% of new and expecting caregivers with infants younger than 1 year expressed willingness to implement early peanut introduction before or around age 6 months, although 40% expressed willingness to introduce peanut after age 11 months. The study also found that 56.8% of these caregivers were unwilling to allow an in-office oral peanut challenge before age 11 months.42 Therefore, a significant gap exists in understanding that must be addressed before broad-based implementation of the guidelines can be implemented. Finally, the recommendations surrounding peanut exposure in schools are areas of significant debate and variability throughout the country. As of 2017, 49 of 50 states had enacted some sort of law requiring schools to stock epinephrine (with most laws providing for an option to stock epinephrine versus a mandate to stock epinephrine), but fewer than 25% of states have any formal food allergy management guidelines.44 There are no state guidelines or allergy professional societies that advocate for allergen bans as an effective strategy to accommodate students with peanut allergy, although this is a popular strategy adopted by many caregivers and advocates.44 Results of a recent study of school nurses in Massachusetts showed that there was no association between “nut-free” schools and a decrease in epinephrine use, although a significant reduction in epinephrine use was found in schools with nut-free tables.45 Therefore, this important issue is still being debated at community, state, and national levels. Peanut allergy is one of the most common food allergies in children and can be life-changing for patients and their families to manage. 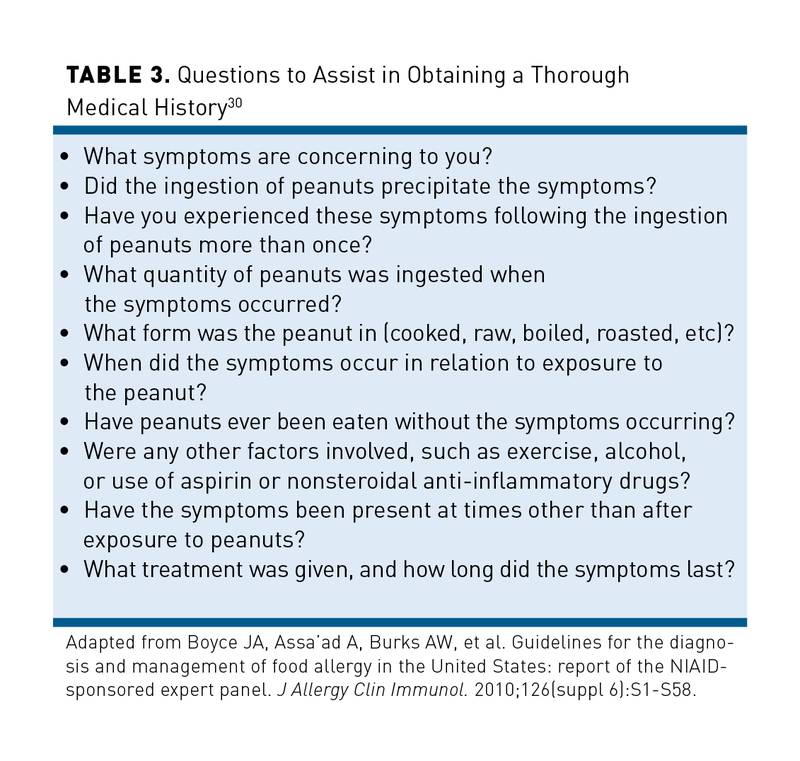 It is critical to recognize and differentiate true food allergies from other conditions and to appropriately introduce peanut-containing foods to infants, especially those at high risk for development of allergy. 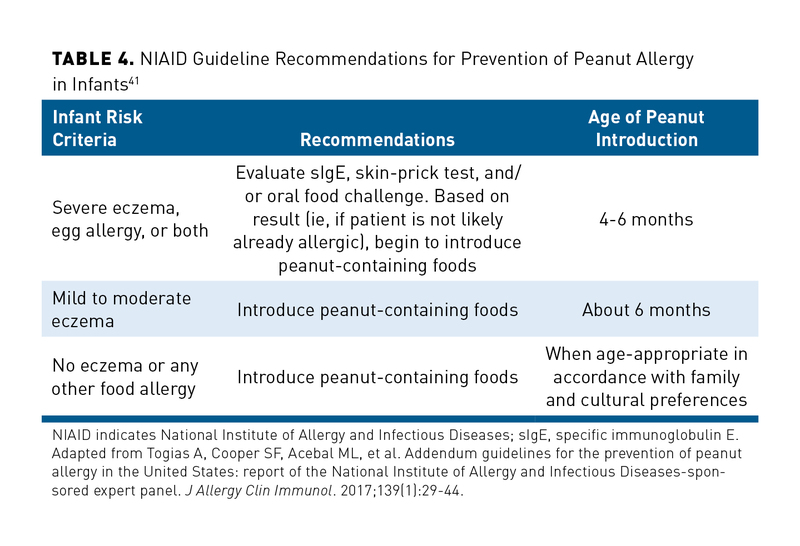 As the understanding of this food allergy evolves, educating parents and caregivers is essential to ensure that new guidelines are being implemented effectively.